The well-known master smith and coach-builder lives with his family in Füzesgyarmat, in the 900 years old township in Békés county. He learnt the basis of this profession from the coach-builder master of Füzesgyarmat in the famous (Járműkészítő és Javító Ipari Szövetkezet) Vehicle-maker and Repairer Industrial Co-op, for today he is the only master smith in Hungary, who possesses the proper qualification for making coaches and works in his profession. He opened his own workshop in 1980, and since then coaches made by the master have already known and been popular not even in Hungary, but in England, Belgium, USA, Austria, German, Netherlands, Switzerland, Croatia, Romania and what is more in Kenya. Galambos workshop moved into a new park of high standard in 2002, where an exhibition room can also be visited. In Galambos workshop, nearly all types of coaches have already been made in the years past. Undoubtedly, the most popular types are the state coaches, the paddock carriages, the marathon coaches and the promenade coaches. In the workshop, not only new coaches are manufactured, but old ones are repaired as well. "Galambos coaches" are made - mostly by hand work - in high quality and precise workmanship, with high standard professional exacting and from suitable material. The Galambos family is committed to rider sports, besides their undertaking (are committed to rider sports). 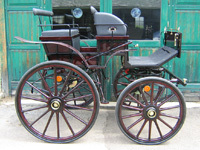 The head of the family is well-known as an assistant coachman and also as a coachman, his son Nádor has followed his father's footsteps and has his own equipage. Mrs Magdolna is the maid-of-all-work of the team, she is a manager and a supporter at the same time. Rita works as an umpire and as an announcer in coach-driving competitions. 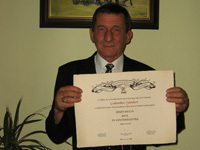 The members of the Galambos family are faithful supporters of the Hungarian coachmen in the world driving championships too.